Respondent to James Ash‘s talk about interfaces based around his book The Interface Envelope: Gaming, Technology, Power (2015, Bloomsbury Press). Chaired by Lucy Kimbell, Director of the UAL Innovation Insights Hub and Professor of Contemporary Design Practices. The interface has emerged as a key site of cultural practice and research with the expansion of digital devices and networked media into everyday life. Often the responsibility of designers and software developers, the work of designing interfaces poses questions about what kinds of human experience are possible or desirable? In the design of interfaces, what kinds of subjectivities are constructed? 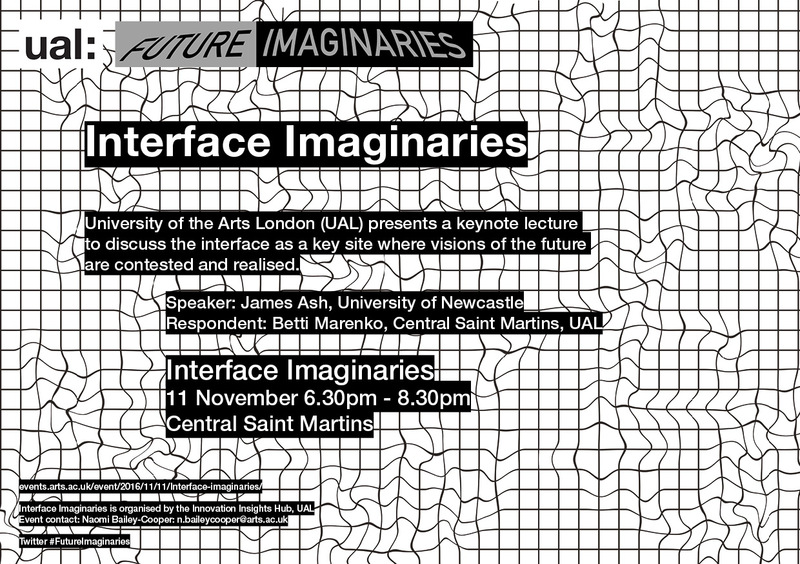 In this talk James Ash will present an account of interfaces that goes beyond a focus on media, design or representation but instead starts with an exploration of what happens in the mediation between bodies, technologies and practices. His research draws on the design of digital games as a particular kind of interface.